Polymeric cryogels are the gel systems formed in moderately frozen solutions or colloidal dispersions of precursors potentially capable of gelling. 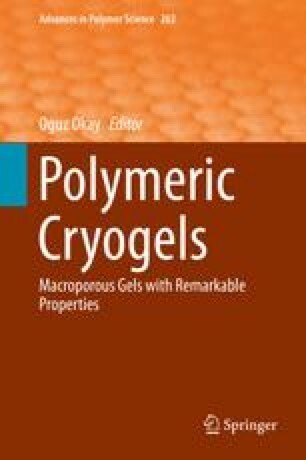 Polymeric cryogels are of growing practical interest in various applied areas. The fabrication of any cryogel includes the following necessary stages: preparation of the feed system, its freezing, incubation of the gelation system in a frozen state, and thawing of the frozen sample. The nature of gel precursors, their concentration in the initial feed, and the conditions of each of the stages affect the physicochemical properties and porous morphology of the resulting cryogels. Certain specific effects are inherent in the processes of cryotropic gel formation, namely, apparent decrease in the critical concentration of gelation, acceleration of gel formation over a certain range of negative temperatures, a bell-shaped temperature dependence of the cryotropic gelation efficiency, and generation of the specific porosity peculiar to cryogels. This chapter presents the basic principles of cryotropic gelation processes and also discusses the factors influencing the properties of various types of cryogels. The work was supported by the joint Russian–Turkish grant from the Russian Foundation for Basic Research (Project # 12-03-91371-CT-a) and the Scientific and Technical Research Council of Turkey (Project # 211 T044). The authors also thank Drs. Andrey Ryabev and Roman Ivanov for the valuable help in the artwork preparation.